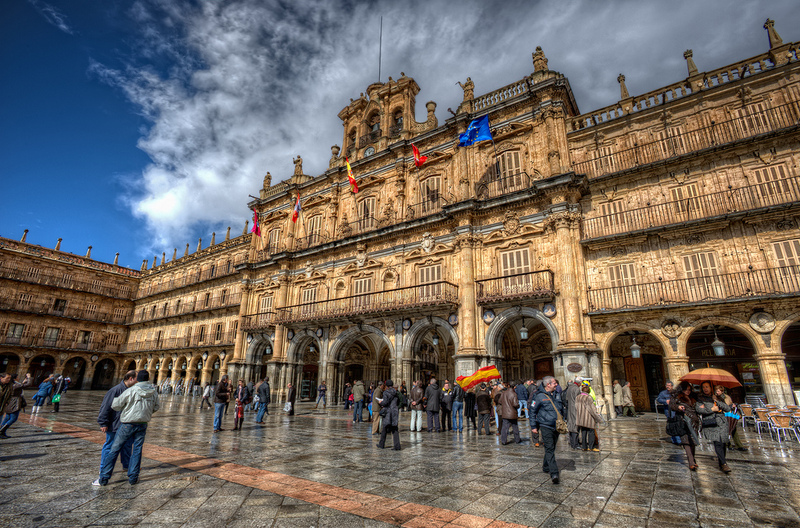 If you are wondering what to do in Salamanca, in this article we will explain to you monuments and plans that you will enjoy for sure. In fact, as other important Castilian cities like Segovia, Avila and Toledo, it was declared a World Heritage site by the Unesco institution. Not to mention its only two and a half hours from Madrid, and be enjoyed in one day. Here are some interesting Salamanca attractions. Clearly, Salamanca is a city tightly related to culture and education. Why you ask? Because the first university of Spain and one of the primitive ones in Europe, was founded here in 1218. In fact, there are many academic buildings than can be visited today. For instance, those which stand around the Patio de las Escuelas. The Escuelas Mayores, Escuelas Menores and Hospital del Estudio are examples.. The most spectacular one is Escuelas Mayores. It showcases a magnificent facade in Plateresque style, which is a landrace Renaissance style dated back to the 16th century. Other remarkable seats of the University are the Colegio Mayor de Santiago el Zebedeo, the Colegio Trilingue and the Palacio Anaya. But this University is not a thing of the past, it is currently one of the main Salamanca attractions and its lively atmosphere is thanks to the numerous High Schools the city hosts. The historic centre is full of young people and interesting bars, that are open until late into the night. Parties, concerts, exhibitions and other events usually take place along these historic streets. The heart of this lively atmosphere is probably the Plaza Mayor, the main square of the city. Surrounded by arched galleries, it is considered one of the most beautiful in Spain, competing with the one of Madrid. This square is absolutely quadrate and amazes all the tourists for its rich decoration and its lovely illumination when the sun goes down. You will also find the bars in the corridors are also crowded and you will be able to have breakfast, lunch, dinner and a cup at night,with cheap prices attached. 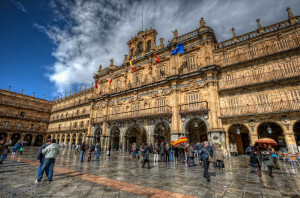 Tourists who love art and are looking for what to do in Salamanca must visit the two cathedrals (yes, you have heard right, the city has two cathedrals), as they are close to each other. The Catedral Vieja (Old Cathedral) was built in the 12th century, originally in Romanesque style but completed in Gothic style. There are many things that stand out in this building. Outside, its great dome, designed in a specific orange-shaped style while inside, it displays a wonderful altarpiece and their Medieval paintings, like the ones of San Martin Chapel. Beyond Patio Chico, you will find the Catedral Nueva (New Cathedral), which is already centures old. It was constructed between the 16th and 18th centuries, mainly in two styles, a late Gothic and Baroque. The thing will astonish you most is the main facade, as it was designed following the example of the Gothic, coming from Flanders. Inside, the cupola is one of the Salamanca attraction that you must not miss..
Salamanca was a very important city in Medieval and Modern Ages, as it conserves lots of religious buildings. For instance, La Clerecia. This is a wonderful temple in Baroque style that is is the headquarter of the Pontificia University of Salamanca, a religious educational institution. The convent of San Esteban, with its amazing arch in the facade, or the Chapel of Vera Cruz won’t disappoint you either. Apart from all this, there are other Salamanca attractions that don’t have to do with education nor religion. The Roman Bridge, is one such place. It is one of the oldest constructions in the city, and you must take into account that this place was inhabited during Roman Era. It dates back to the 1st century A.D. and is also famous because the ancient novel Lazarillo de Tormes was set around here. And of course, we cannot forget the numerous palaces and noble houses that are scattered all along the city, which serve as proof of the economic power that this city used to have. We will stand out at the Casa de las Conchas. This palace, which hosts a public library today, surprises the visitors with a facade full of shells, the symbol of the Order of Santiago. There are 350!